The Senate is facing what could be the last chance to pass a market stabilization measure as odds of passage look dim with increasingly politicized discussion over the legislation. GOP leaders in the House scuttled the measure Monday night. Sen. Susan Collins (R-Maine), who along with Sen. Lamar Alexander (R-Tenn.) has championed a bill that would fund cost-sharing reduction payments and a $30 billion reinsurance pool, said Tuesday that she sees Friday at midnight as the last opportunity to get the measure through. That's when Congress must pass an omnibus spending bill to avert a government shutdown. 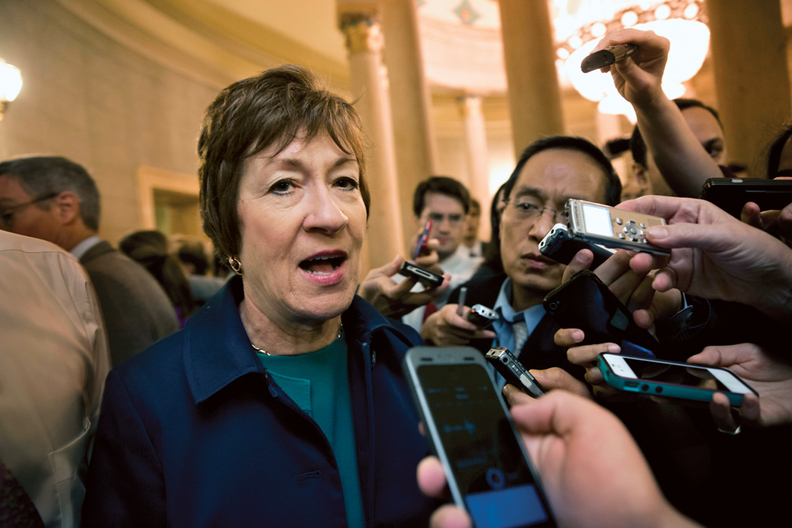 "This is the last must-pass piece of legislation," Collins said. "It is possible it could pass as a separate bill, but I'm not optimistic that that will be the case." Senate Majority Leader Mitch McConnell (R-Ky.) is open to bringing the bill, which Alexander released on Monday to heavy criticism from the Democrats, to the Senate floor. The bill combined his policies with those proposed by Collins and U.S. Reps. Greg Walden (R-Ore.) and Ryan Costello (R-Pa.). A floor vote would force senators up for election this year to go on record with their support or opposition. Premiums for 2019 will be released in October, one month before voters go to the polls. "The question Congress has to face is: Do we want to make a real difference in the rates that will be published this fall, or not?" Collins said. "And this is the only real opportunity to do this, and to have what every study has shown would be a significant impact in making health insurance more affordable." It is unclear whether McConnell would present the bill as a stand-alone or as an amendment to the spending omnibus. On Tuesday afternoon, aides said that talks haven't progressed to that level of specificity. "This has to be fixed," U.S. Rep. Tom Reed (R-N.Y.), who co-chairs the moderate Problem Solvers Caucus, said Tuesday. "This is not going to get better with time and we're going to see real impacts of not addressing this." Reed emphasized that many GOP-leaning districts will see the brunt of the premium spikes anticipated for next year. Rural areas, which often have just a single exchange carrier, have consistently borne the highest premium increases. "We're turning our back on people who have stood with us through these difficult times," Reed said. "And if CSRs aren't the solution, give me a different solution to consider." Sharp disagreements over the policies in the Alexander-Collins-Costello-Walden bill, which the senators who led stabilization negotiations tried to stem for months, spilled out into the open Monday when Alexander released the text. Provisions in the bill would block insurers from suing for unpaid CSRs from 2017—a measure requested by the White House, according to text obtained by Modern Healthcare. Another would codify the Trump administration's expansion of association health plans. Then there was the expansion of Hyde Amendment anti-abortion language, which both Republicans and Democrats have called the linchpin for the deal's breakdown, although aides said privately they believed the disagreements could be resolved. So far stakeholder groups including insurers, provider and advocacy associations have stayed quiet on the legislation, although a wide coalition sent a letter to Congress early Monday urging lawmakers to fund CSRs and reinsurance. Sen. Patty Murray (D-Wash.), who had worked with Alexander on the original stabilization deal starting last fall, branded the effort as partisan, undermining coverage for people with pre-existing conditions and imposing "harmful, last-minute restrictions on abortion coverage." Murray called on Republicans to return to the table for more negotiations. Alexander hit back, arguing that the Hyde Amendment language—which so far has not been applied to the ACA—shouldn't derail the bill. "It is disappointing that an opportunity to lower health insurance rates by up to 40% for working Americans has turned into a debate about the mechanics of funding for abortion coverage," Alexander said. "Every year since 1976 Republicans and Democrats have agreed that federal dollars cannot be used to fund elective abortions, and our proposal does not change that." Reed and other Republicans said the Hyde Amendment disagreements only mask conservatives views on using federal dollars to shore up the Affordable Care Act's individual markets, which Republicans have long decried. Costello, a vulnerable GOP incumbent who spearheaded the stabilization effort in the House, was optimistic Tuesday that something could still pass this year because of the potential premium increases if nothing is done. He criticized Democrats for "playing politics" over Hyde, but said the conservative angst over the ACA did play into the House gridlock. "The problem we have is, you have some conservatives who don't want to fund CSRs at all, and when you don't have any Democratic votes, you create additional leverage points for those who may be opposed to CSRs," Costello said. "The finger is not just pointing at Republicans for that." But Costello also conceded that introducing association healthcare plans into the language could become problematic on both sides because it could "mean anything." And Democrats who branded the legislation as partisan highlighted the provisions that they say promotes worthless coverage. "Between high-risk pools that isolate people with pre-existing conditions, junk insurance that will let insurance companies trample on consumers' rights and a massive and unprecedented restriction of a woman's right to choose in the private market, congressional Republicans laid out their ideological priorities that will limit access to healthcare and increase premiums," said Senate Finance Committee Ranking Member Ron Wyden (D-Ore.).